Stockholm, Sweden is the home of Doom/Death Metal band, SOLILOQUIUM, which translates to "talking to one's self”, in Latin. The band began their journey in the year 2011 and it started out as a side project between Stefan Nordström and Jonas Bergkvist, who play in the Thrash Metal band DESOLATOR, and Mortuz who is involved in the band MIST OF MISERY. Stefan Nordström is the main conspirator for the band and the idea of creating a Death/Doom Metal band came to him, as he had a bunch of Death/Doom Metal riffs lying around. 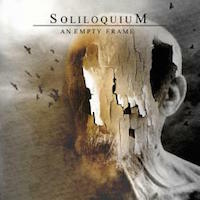 The word Soliloquium is borrowed from the Italian Gothic/Doom Metal band, THE FORESHADOWING. The band claims bands like KATATONIA, ANATHEMA, DEATH and DISMEMBER as their main influences. The band has released two EP's entitled, "The Concept of Escape" and "A Night Of Burdens", in the year 2013 and 2014 respectively. They followed that up with a compilation album called absence in the year 2016 with 8 tracks that included a cover version of the track, "Zombie", by the CRANBERRIES. The band, strangely does not intend to tour or perform live as their main focus is the band DESOLATOR. "Eye Of The Storm" is the first one out of the stable and starts out with a vigorous fervor. The heavy chugging riff complimented with Death Metal guttural lead vocals make a good mix. All of seven minutes of tortured depravity, the song also has keyboard sounds incorporated into it and is replete with memorable gloomy riffs. Double bass drum action ably supports the melody and the tortured vocals. Half way through the song, a simple acoustic melody makes its appearance and is a clever respite from the drudgery that preceded it. The acoustic melody buttresses the song till its conclusion. "Earthly Confine" starts of with a simple ethereal melody and has clean singing and is almost choir-like in nature. A song that is just under 6 minutes in run time, the song is built around the opening melody and is a complete departure from the violent previous song and doesn't feature growling vocals at all in this track. The riff kicks into high gear around the 4-minute mark when the distortion comes alive accompanied by furious drumming. "With Or Without" is the fourth song on the album and it clocks just over 6 minutes and it starts life as a simple, poignant acoustic melody. The song has clean singing initially before the cavernous vocals come roaring and injects life into the song. The song has heavy riff parts that are interleaved with simple lead melodies that offer the listener some letup. The vocal range continues to impress and the deep guttural vocals are indeed a pleasure to listen to it. The latter part of the song is an acoustic passage that guides the song to its demise. The stand out track in the album, "The Observer", is an 8-minute dirge that will depress and delight at the same time. Right from the start, the track is melancholy and direful. The song is again interspersed with chugging; heavy riffs and elevated simple guitar lead parts. The song takes a turn to a faster tempo midway through the song with an accelerated lead before grinding to a sludge filled slow tempo. The track is punctuated with rapid sections, clean singing and slow lumbering sections that will undoubtedly surprises the listener. The album closes out with "Fear Not" which begins with a simple oddly timed acoustic melody. The song accelerates after about a minute and is one gets a feeling that it’s not an entirely technical track. A track just over 5 minutes in run time, it doesn't capture the mood that the album sets out to establish. The album has brilliant production value and the vocals are a revelation but one feels a little let down is that the tracks in themselves are repetitive in nature. Even thought the band tries to shake things up and try to deliver unexpected melodies and harmonies, they tend to stick to a formulas that can get repetitious after a couple of tracks. Clean singing during some of the tracks works just as well as the gravelly vocals. However one feels that the band isn't breaking any new ground here on this album .The melodies themselves seem a little simplistic and not terribly intricate. Heavy riffs built around simple lead notes may work in some cases but more often than not, it leaves more to be desired in terms of technicality and complexity of the songs. An interesting album and I hope that the band comes up with more music that fans can look forward to.